What if Blackburn Rovers were a ‘two-man team’? Much talk already this season about Liverpool being a “two-man team”, ie. Steven Gerrard and Nando Torres. Both of whom are almost dead right now. We’ve done Arsenal, Aston Villa and Birmingham City already. Today is the turn of Big Sam’s Blackburn Rovers. Which two players do you see? 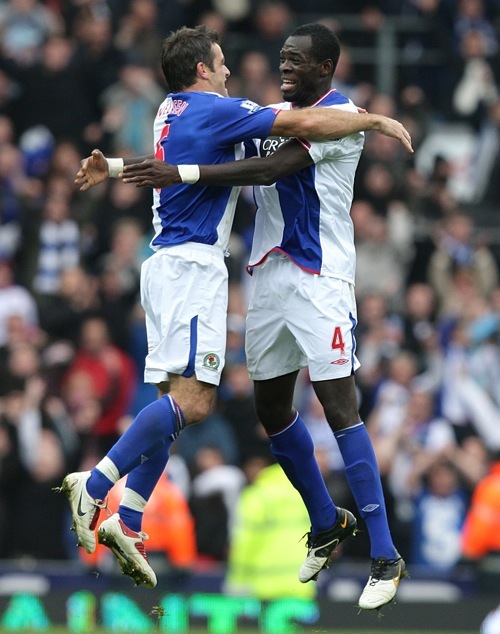 I see Ryan Nelsen and Chris Samba, two men I wouldn’t want to meet in a well-lit alley, let alone a dark one. David Dunn without a doubt. And I’ll go with Samba as well. Pedersen? Really? Minimal contribution most of the time except for wonder-strikes and those have dried up the last two seasons. Currently Dunn and Robbo would be the two-man team. Dunn is our one creative player and Robinson is playing extremely well and bailing out a stuttering defence. This season Samba and Dunn (Dunn’s edged the Admiral out but Givet is knocking on the door). How the blazes have 3 people gone with MGP? I’m guessing that these voters support other teams and simply don’t know any other Blackburn names. Dunn when he’s playing like he is at the minute no doubt, then i would go Samba or Robinson, we really need some good spending though!! !